So hello guys. I am new in this forum and i need your help soo much! So i have a Metin2 Server [freebsd 8.2]. The point is that when i tryed to do something i accidentaly moved /etc to /etc/etc and now i cant do nothing. I'm sorry for my noob language level. Someone is flooding my VDS [ 2 GB RAM] on port 3306. I did not want change it because website didn't connect with IP:newport [tested] and cand be easy finded with port scanner. I want a method for full protection on a VDS. See Do not post METIN / METIN2 topics on these forums!. Sorry, i want a firewall not make ad. for this game. I only responded to your original post to set your level of expectations: you should not expect help on this forum for issues related to METIN2 servers, including firewalls. Editing your original post to remove the reference to "METIN2" does not change anything, especially in light of your rather obvious account name. Hy, i have a virtual server where i'm hosting my website & forum database. Somebody blocking that VDS flooding port 3306 [tested, when i close it server working normally]. I changed the port but him easy finded it. I tried some ipfw.rules/pf.conf but without succes. I have FreeBSD 10.0 32 Bits. You neglected to mention it also hosts your METIN2 server, but I'm sure that was intentional, since it's what got you clobbered yesterday. This is the same problem as your first post as @Metin2HFM (created yesterday), now disguised as your first post as new user @qualityhost (created today). I've deleted the file /var/db/mysql yesterday 28/12/2014, and I want to restore it. Is there a direct way to bring it back? For a way backup copy or any other way? I apologize because I could not reach a solution because I speak Arabic. Did you explicitly make a backup or take a snapshot? If yes, then why can't you just copy it back from the backup or snapshot? If not, you're out of luck. Indeed. If you haven't made a backup yourself the directory and its contents are gone. I've made backup. How to retrieve it from two weeks ago? That's impossible for us to say because we don't know what backup.sh exactly does. If that file isn't too large you could paste it here so we can take a look at it, but no guarantees of course. command http://leaf.dragonflybsd.org/cgi/web-man?command=hammer&section=8 Oh wait a minute ZFS doesn't have history it only have pre-scheduled snapshots. What a bummer? Just teasing, just teasing I learned about lack of ZFS history few years back from you . HAMMER has serious limitations too. There is a reason Matt start writing HAMMER 2. However, this is just a brilliant example where HAMMER really outperforms anything in existence so I could not resist posting it. What rm(1) does, is *unlink* the file with the unlink(2) system call. and decrements the link count of the file which was referenced by the link. "all resources associated with the file are reclaimed." effectively means that the entry is removed from the superblock, which means that the data is considered to be "free", *but the bits are still on the disk*! # Now search for the string on the raw disk device (which should succeed). This script should find the %%% UNLINK-ME %%% string still on the disk, even though we already deleted the file. The problem is, if we start writing to this filesystem, you run the risk of overwriting these free blocks with something else. **SO DON'T WRITE TO THIS FILESYSTEM**; writing to a different filesystem on same disk should be fine in the case of UFS, but I'm not sure if this is also the case with ZFS. 1. You can use photorec, this is a free tool, and scans the disk for file signatures, for example, every JPEG files starts with the same header pattern; photorec looks for these patterns, and attempts to recover files this way. This works quite well for non-fragmented data; sometimes files aren't written to the disk in continues blocks, and photorec doesn't read the superblock. Usually filesytems try to write data in continues blocks if possible, but this is not *necessarily* the case, especially when your disk is almost full, or when a file "grows" over time, which is typically the case with a MySQL database. (this is why UFS reserves 8% of the diskspace by the way). So you could try using photorec, but I don't think it will work well in this case. 2. A second option is to see if we can recover the file from the superblock; the superblock is basically just a table which describes which blocks belongs to which files. If you remove an entry, this space is not immediatley reclaimed, rather, just like with files it is marked as "free" space. So you could recover data from the superblock. You are 100% and we should have approached his question more seriously but it was all too easy to poke fun of his mischief. While I have some relatively recent experience recovering files from NTFS I have little experience recovering files from UFS but I know that is possible as long as you don't overwrite anything. With ZFS situation is even more tricky as I learn trying to destroy some data in our lab. Due to possible multiple blocks of the same data even overwriting a file with pseudo-random number multiple times doesn't guarantee that the file is truly erased as there might be multiple blocks of the same data. We are not helping him here but it is definitely interesting topic. You are 100% and we should have approached his question more seriously but it was all too easy to poke fun of his mischief. Both correct but I wasn't really poking at anything. Although it's true the file is never really gone it's certainly no guarantee you can get anything back. Even with forensic tools it's tricky to restore deleted files. With ZFS situation is even more tricky as I learn trying to destroy some data in our lab. Due to possible multiple blocks of the same data even overwriting a file with pseudo-random number multiple times doesn't guarantee that the file is truly erased as there might be multiple blocks of the same data. Multiple blocks of data aren't even the biggest problem. ZFS is a copy-on-write filesystem so you're never actually overwriting the old file's data. We are not helping him here but it is definitely interesting topic. Did not understand anything because of the language and translation of Google and I thank you all for help. echo "Delete logs Server :)"
Hi, does anyone know how can I configure FreeBSD system can assign to a domain? 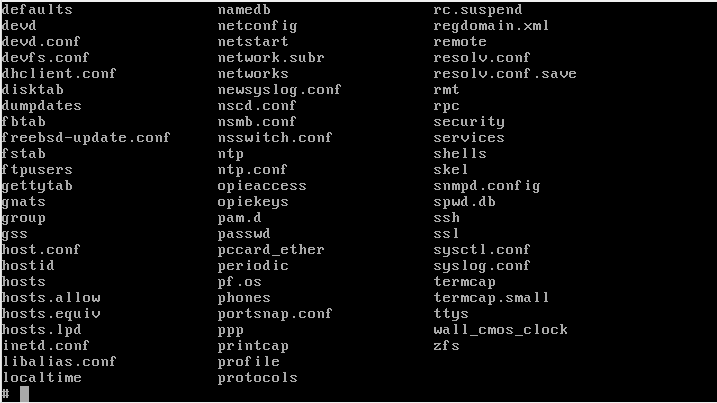 Now you need to associate a domain to this webserver FreeBSD, how can I do that? So I want to associate a domain to that webserver. For example, when you type in Internet Explorer: www.abcdef.com I show my web server at that. So, I want to create two nameservers, for this domain. The question is unclear. "Associate a domain" does not describe the problem, or why you think BIND is involved, or what a "four nameserver" or a "two nameserver" are. This could be a virtual domain for the webserver, or could involve buying a domain name from a DNS registrar. Please assume the reader knows nothing about your situation and ask the question in more detail. Edited, I hope you understand now.